CarLock is an intelligent system with unique security features that enable you to be notified when your car’s engine is started or it is being moved. While CarLock tracks your vehicle all the time, you are in charge when and how you want to be notified about any suspicious activity. We assume that you have successfully activated your CarLock account by now and logged in to the CarLock app. If you have any problems with the activation process, please let us know on support@carlock.co. 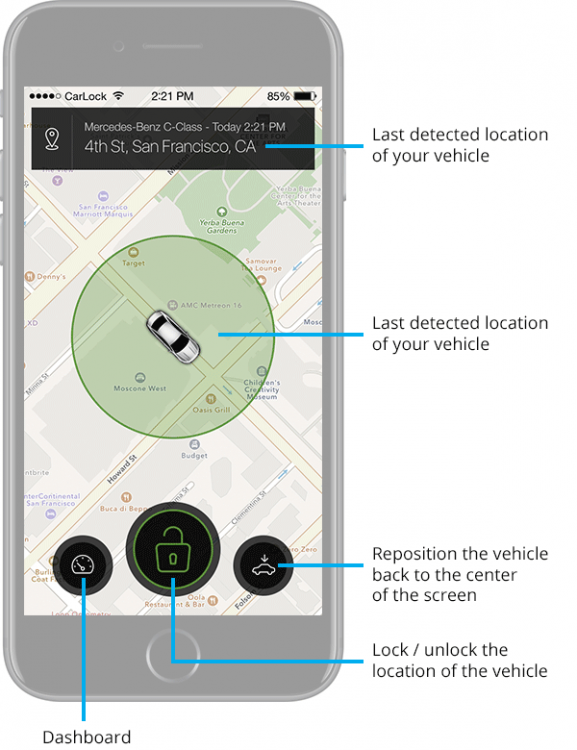 When you open the CarLock app you are greeted with a map, showing your vehicle’s location. On the top, you will see your vehicles name and last detected location. You have two main controls on the bottom — the bigger, security “lock” button in the centre of the screen and the smaller button to open the Dashboard on the left. If you move the map around, a smaller button will appear on the right to reposition the vehicle icon back to the centre of the screen. If you see the green circle around the location of your vehicle, you will not receive any security notifications. Lock icon shows that location is not “locked” — CarLock is not armed. Green = no security notifications. When you arrive at your destination or park your car at home, you can arm CarLock to “lock” the location of the vehicle. Tap the button with a green lock icon. Circle and lock icon will change from green to orange — CarLock is now armed and the location is being monitored. Orange = You will receive security notifications. Please note that depending on your phone’s internet connection it can take few seconds to “lock” the location of the vehicle. If CarLock is armed and the vehicle is moved outside the monitored area (orange circle), you will be notified with a loud alarm. When you open the app after “Vehicle Moved” alert, you will be able to see the current location of the vehicle and the path your vehicle took to get there from the monitored area. The vehicle was moved outside of the monitored area. To reset the monitoring, just tap on the button with a “!” icon. CarLock will reset the monitored area to the current location of the car. It is recommended to reset the alarm every time it happens otherwise you will not receive “Vehicle Moved” notification next time your vehicle is moved because it is already outside the monitored area. You only receive this notification once vehicle moves outside of the monitored area. Thanks to a very useful AutoLock scheduler, you can teach the CarLock system to automatically start and stop monitoring the location of your vehicle. Just tap on the hours you want your vehicle to be monitored. The system will now automatically start monitoring the current location at midnight and automatically disarm at eight o’clock in the morning when you go to work. Example: You can set scheduler to arm the system only at night. If you have any questions about CarLock security features, let us know on support@carlock.co.